"Online forums and lay literature suggest that partners of individuals with Autism Spectrum Disorder (ASD) experience depression, distress, and trauma in their everyday lives, exacerbated during the time surrounding diagnosis. 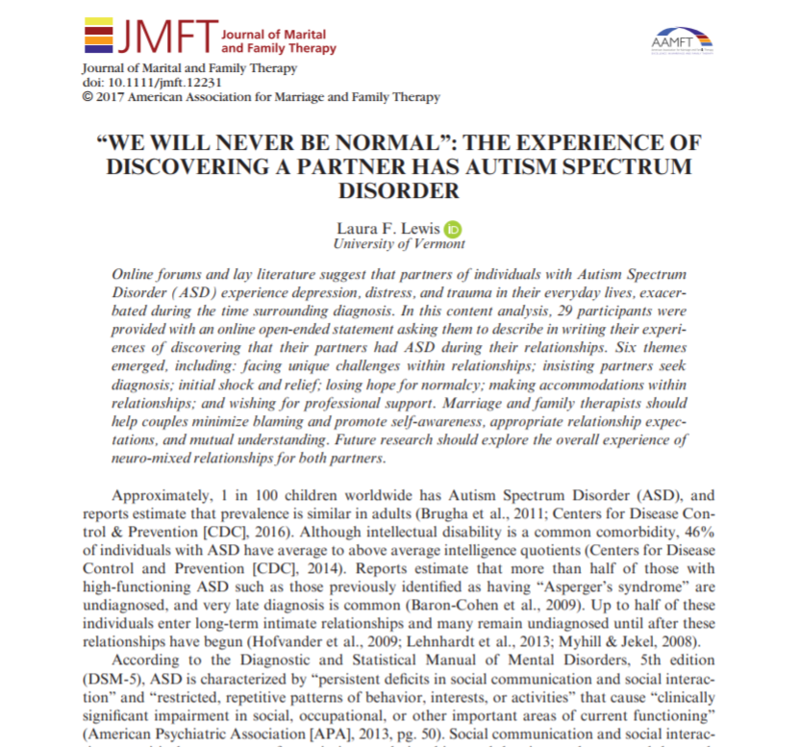 In this content analysis, 29 participants were provided with an online open-ended statement asking them to describe in writing their experiences of discovering that their partners had ASD during their relationships. Six themes emerged, including: facing unique challenges within relationships; insisting partners seek diagnosis; initial shock and relief; losing hope for normalcy; making accommodations within relationships; and wishing for professional support. Marriage and family therapists should help couples minimize blaming and promote self-awareness, appropriate relationship expectations, and mutual understanding. Future research should explore the overall experience of neuro-mixed relationships for both partners."